Jason (Rafi Gavron), a first offender, is arrested on drug charges that could have him facing at least 10 years in prison. John (Dwayne Johnson), Jason's father, offers to bring the police a bigger drug dealer in exchange for a reduced sentence for his son. Now, this average dad must go undercover and lead federal prosecutor Joanne Keeghan (Susan Sarandon) to a big arrest in order to save his son. Loosely, and we mean very loosely based on a true story, "Snitch" is a drug crime drama directed by Ric Roman Waugh. 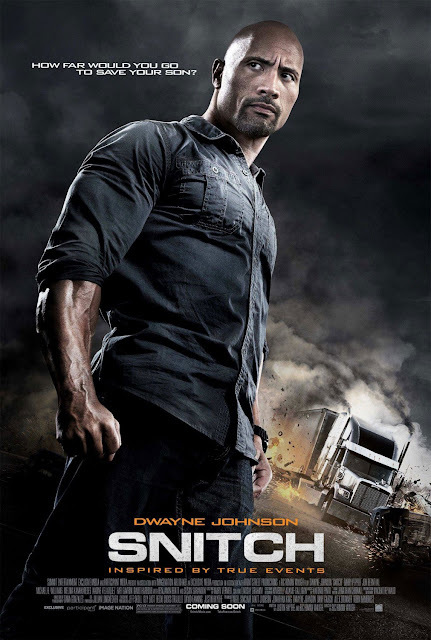 It stars Dwayne Johnson as John Matthews, the owner of a trucking company. John's 18-year old son Jason, played by Rafi Gavron, has just been arrested on drug charges and is facing 10 years in prison despite being a first time offender. The subject of this movie is actually based on a Frontline special that was a condemnation of America's minimum drug sentencing laws. It would appear "Snitch" initially has the same goal as the Frontline episode, but it gets lost along the messy way. Jason is set up by a friend, a friend who is a drug dealer working with the DEA in what is a clear case of entrapment. Any competent attorney knows that a case like this could get thrown out of court very easily. However, this is a movie, and filmmakers need their accused to not only be sympathetic, but to be a clear cut innocent victim of circumstance, laws be damned. Jason won't snitch on anyone, but his father John is more than willing to work with federal prosecutor Keeghan, played by Susan Sarandon, to set up a few more drug dealers to get his son a reduced sentence. So, a man with no criminal record and no knowledge of drugs or crime or anything related to that world is allowed to go undercover. He has one of his employees named Daniel, played by Jon Bernthal, who just happens to be an ex-con, introduce him to a few local dealers. Oy vey, the suspension of disbelief. The rest of "Snitch" is your standard action thriller with a hefty dose of father/son/ex-wife/new wife and new kid drama throw in for...what exactly we're not sure because we never once felt bad for Jason. This whole thing winds up delivering the message that laws like this actually work as intended, that arresting small time drug dealers and threatening them with unreasonable jail sentences leads them to turn state's evidence on their suppliers all the way up the chain of command to a major cartel player. HA HA HA. It's laughable, really. Beyond its failure to accurately deliver its message, "Snitch" is also extremely slow moving and mostly flat out boring. Unlike other intolerable films starring The Rock, here, it's as if Johnson has been told to turn all of his natural charm off in favor of brooding drama. He gives such a subdued, robotic performance that it became hard to root for him to succeed. Johnson is not terrible in this, mind you, it's only that his best qualities, the ones that make him so appealing in the first place, have been entirely stripped away. We love you, Dwayne Johnson, but dude, drama ain't your thing. There are a few supporting characters that are decent here, especially those played by Susan Sarandon, Jon Bernthal, and Barry Pepper, though Pepper's facial hair may make you frightened at the sight of it. The lesser known people in the supporting cast, mostly those fleshing out the drug gangs, are downright terrible and really hard to watch. We're not sure if any of them are actually actors or if they were people with real life experience in such a subject matter, but their screen presence made for a difficult watch. We're not going to lie, "Snitch" lost us in the first 15 minutes and never won us back. After a clear disregard for real state laws, an unsympathetic son, and a complete disconnect with his father figure, sitting through nearly two hours of this movie made us happy that it was over. One year ago, we were watching: "Welcome To Me"